Oklahoma is number one – in public school funding cuts! Oklahoma is number one! IN PUBLIC SCHOOL FUNDING CUTS. Oklahoma voters are to blame. They elected a governor and legislators who have repeatedly cut income taxes even amidst the Great Recession, starving our schools. When are parents going to WAKE UP and do something about this? Tell your local state representative, your local state senator, and the governor that Oklahoma must stop cutting taxes and start putting SIGNIFICANT amounts of money back into its public schools. That data is from the latest report by the Center on Budget and Policy Priorities. These funding cuts are why we are having so much trouble hiring science, math, special education, and foreign language teachers. They can get better pay and working conditions in any neighboring state. 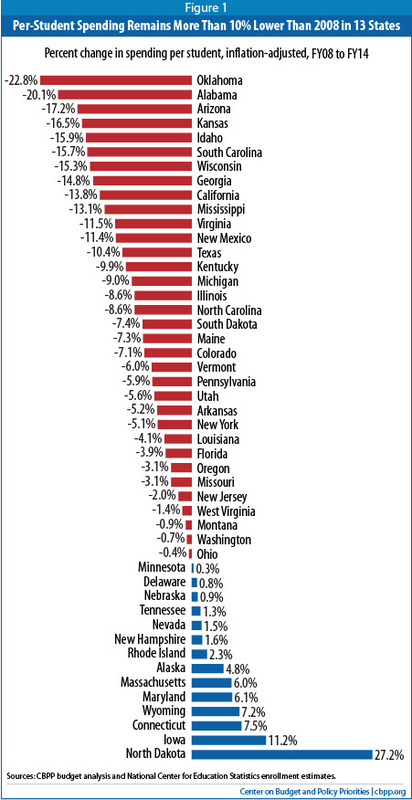 The next time Governor Fallin boasts that Oklahoma did fairly well during the recent economic downturn, will someone please remind her that our schools have fared WORSE than in ANY other state? The tax cut policies of our current state government make no sense and are willfully destructive. 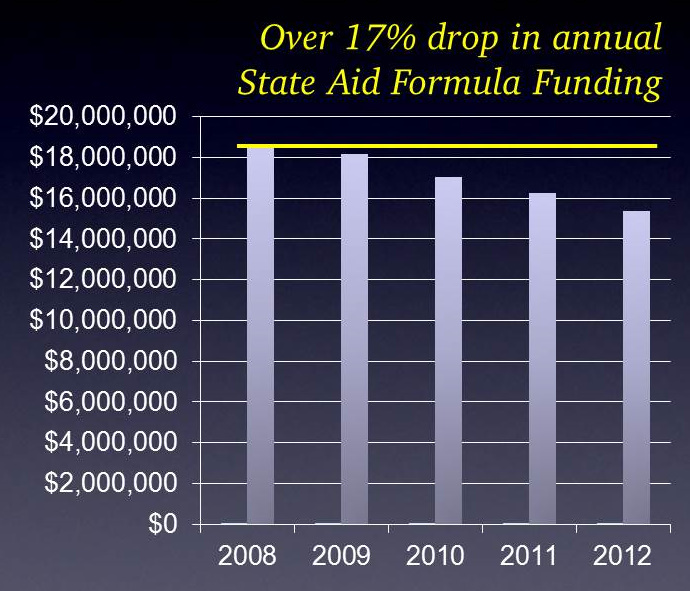 Our local school district’s annual state aid formula funding is down over 17% since 2008, or over $3 million a year. A continuing onslaught of unfunded mandates, invalid district report cards, after-the-fact increases in cut scores on graduation tests, poor salaries, increasing class sizes, and more are making teaching in Oklahoma less and less attractive. Bartlesville finally stepped up to the plate this week and passed a bond issue to improve its pathetic middle school facilities. But bond issues pay for buildings, not salaries. They pay for capital costs, not operations. Bond issues don’t feed into the general fund, 90% of which goes to personnel costs. So bond issues can’t make up for the record losses in state funding for our schools. Folks, you get what you pay for. And Oklahomans are NOT paying for good schools.